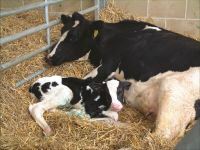 Local dairy farmers are invited to attend a ForFarmers event on transition and colostrum feeding, being held at The Lysley Arms, London Road, Pewsham, Chippenham, SN15 3RU, on Wednesday 29th November. ForFarmers Alison Boydell will be speaking about the importance of the transition cow period in setting up a strong lactation. Ann Combes, a ForFarmers youngstock specialist, will present recent research on accelerated calf growth and development through colostrum quality. The importance of calf development in the first 12 weeks of life will also be discussed. The meeting is free to attend and includes a pub lunch, but please register attendance by Monday 27th November to Matthew Green 07802 173271 or email matthew.green@forfarmers.eu.